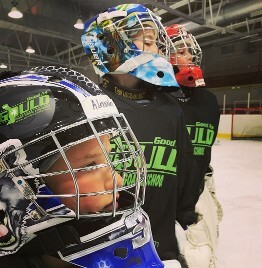 Good As Gould Goalie School offers private goalie clinics to small groups and individuals. Clinics most often accommodate up to six goalies per session to provide intensive individual instruction. The typical clinic consists of four to six sessions that last one hour. Each session emphasizes specific developmental concepts and begins with ten to twenty minutes of skating drills. Clinics are held at North Shore Ice Arena, All Seasons Ice Arena and Willowbrook Ice Arena. For more information, including price and available appointment times, please call Stu at (630) 753-9645.